By Amy Grehan | December 3, 2013. 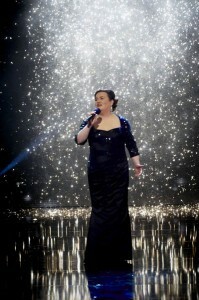 Susan Boyle performing in the final of Britain’s Got Talent in 2008. She was runner up to dance group Diversity. 2013 is looking like the year of the reality show Christmas album as Susan Boyle, Leona Lewis and Kelly Clarkson all have Christmas albums hitting the shelves in time for the festive season. Susan Boyle’s ‘Home for Christmas’ is her fifth studio album in four years; and, as another achievement, she will be the first British artist ever to have a posthumous duet with the King of Rock ‘n’ Roll, Elvis Presley, which features on the album. Boyle’s stunning new album of her favourite classic Christmas songs includes the likes of ‘Little Drummer Boy’ and ‘When a Child Is Born’ and also an original song, ‘Miracle Hymn’, taken from the soundtrack to her first upcoming movie ‘The Christmas Candle’. ‘Home for Christmas’ was produced by Cliff Masterson and Steve Anderson who have worked with the likes of Lionel Richie, Kylie Minogue, Emeli Sande and Westlife. Leona Lewis’s ‘Christmas, With Love’ features her new single ‘One More Sleep’, as well as new tracks ‘Mr Right’ and ‘Your Hallelujah’, which Lewis co-wrote. Her new album features some festive classics such as ‘Winter Wonderland’ and ‘White Christmas’. The album gives us a version of ‘Ave Maria’ where she showcases her fantastic voice and performs the track in Latin. Kelly Clarkson’s Wrapped in Red starts off with two originals, the title song ‘Wrapped in Red’, and the first single ‘Underneath the Tree’, which will definitely have you dancing during the holiday season. Christmas classics on the album include ‘Have Yourself a Merry Little Christmas’, a fun version of Chuck Berry’s ‘Run Run Rudolph’, ‘Baby It’s Cold Outside’, a duet with Ronnie Dunn ‘White Christmas’, and the classic ‘Silent Night’.